Believe everything you read? Ever since reading Ben Goldacre‘s book, Bad Science , I’m much less trusting of stories using numbers to illustrate a point, especially when prefixed with “scientists say”. But just how difficult is finding the real facts behind a story? The challenge, aside from finding time, is to make sense of whatever facts and figures are being used to illustrate the point, especially if that proof is in an academic paper or a bank’s financial results. Brain pain. So, it was with some trepidation that I decided to try and verify that The Guardian had dropped a clanger in an article in this Saturday’s business section. With the background of RBS’ first profit since the tax-payer shelled out £20bn to keep the organisation afloat, the article asks how management can justify paying bonuses when the government is still owed. And owed big. However, the graph (see below) used to illustrate the article didn’t quite ring true. Of the two divisions showing a loss, US Retail & Commercial shows a loss of £51bn. Even in a world where we’ve graduated from bandying around ‘billions’ instead of ‘millions’, this seems like a hefty chunk of cash. 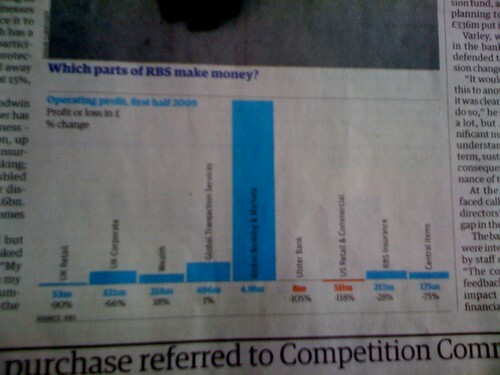 If this were correct not only would the red bar in the graph have to extend off the edge of the page, RBS would have posted a £44.7bn loss, which, I’m pretty sure, would be a bigger headline than anything about bonuses. So, with @bengoldacre in the back of my mind, I decided to see if I could find the original material and double-check the figures. A rummage through the RBS corporate website reveals two documents, the interim results slides and the full version. The data for the graph (not including the typo) is on page 29 of the 204 page report, not including appendices, if you’re interested. It confirms the typo and a mere £51m loss. RBS shareholders can rest a little easier. What this does confirm is a deep respect for the thankless job facing journalists wanting to do a thorough job. Put this into context against hastily written blog posts and the debate about how to pay for investigative journalism becomes ever more important. Gap risk products are leveraged trades, with the counterparty’s potential loss capped at the amount of the initial principal invested. Gap risk is the probability that the market will move discontinuously too quickly to exit a portfolio and return the principal to the counterparty without incurring losses, should an unwind event be triggered. This optionality is embedded within these portfolio structures and is very rarely traded outright in the market. Gap risk is not observable in the markets and, as such, these structures are deemed to be level 3 instruments. Ever wondered how we got into this financial crisis in the first place? Dunno about you, but I’m not sure I like the idea of an unwind event, unless it involves a cute cat and a bundle of wool.